From early Renaissance painting to the 21st century collections exhibited at Lake Forest’s Sonnenschein gallery, food has played a regular role as both a subject and a medium. Art and food have always been intertwined. 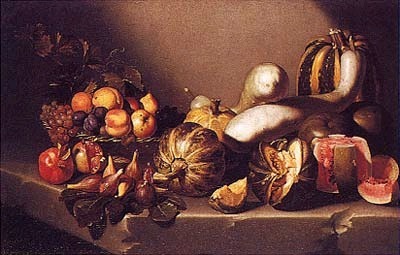 A regular subject matter, food was at first a political statement, a “gastronomic assault” of noble excess and elaborate feasts in Italian Renaissance painting.Later there were gardening scenes and still-lifes filled with exotic fruits and vegetables. Foods began to take on certain symbolism, denoting things like wealth, power, regions, or religions. 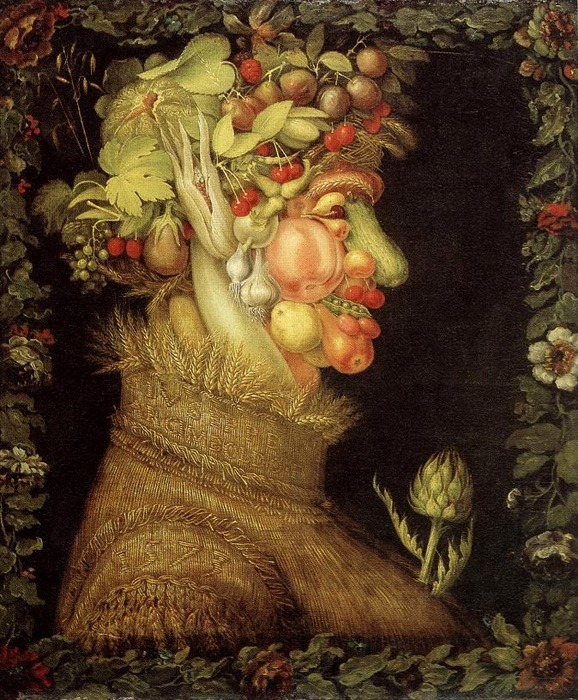 Artists like Italian Artist Giuseppe Arcimboldo [fig.1.1] and Caravaggio [fig. 1.2] perfected the genre. Eventually, the profusion of food related imagery would inspire Italian painter, Annibale Carracci, to develop the first genre painting. Solomon H. Katz, “Painting and the Visual Arts” Encyclopedia of Food and Culture, Vol.1 ( New York: Charles Scribner’s Sons,203). Oil on canvas, 41" x 33"